Physical Education has got off to a very exciting start this year. The children have been bouncing around full of energy and they are certainly keen and motivated when learning and developing their skills. The children have been focusing on a new unit of work in Reception and Key Stage 1 – Fundamental Movement Skills (FMS). They are working on year group appropriate activities that build upon their natural abilities in order to advance their performances in sport. The children are working to develop their body management skills, object control skills and locomotor skills. We have been working on balance, agility, hopping, speed and dodging so far with further units including sprinting, jumping, throwing, climbing in the coming weeks. As you can see by the photos, the children are doing really well and this work should transcend from the FMS unit directly into the sports the children take part in, not only during PE, but also during their time outside of school. The reception children have also been playing parachute games. 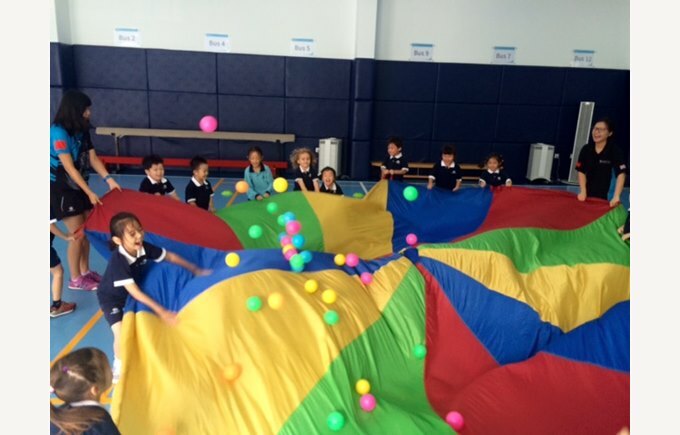 Parachute games are great fun and encourage cooperative and non-cooperative play. The games can help develop team play, motor skills and physical fitness along with problem solving and team building. Year 1 and 2 children have begun developing their football skills and football seems to be everyone’s favourite sport here at BSB - much to Mr. Laird’s delight! The children have been working on dribbling, passing, shooting, ball control and have started to play small-sided games. Club Football will be coming into school next week to deliver some taster football sessions to the children. Key Stage 2 has been working with a focus upon the forthcoming cricket competition at Dulwich School. Consequently, the children have been working on batting, bowling and the art of fielding. They have taken part in a series of practice drills to encourage skill development of each area and they have also had the opportunity to take part in small sided cricket games. Maybe BSB Sanlitun has a team to take on Australia! The children have also been working on team building exercises; a game they have really enjoyed is guiding each other blindfolded through a dangerous mine field – designed to build both communication skills and trust. The Year 5 and 6 swimming unit started this week. The children will be working on developing and refining their swimming strokes and skills over the next 6 weeks with some personal survival activities included into the programme to educate them about the importance of water safety.